Location: Four miles southeast of Center, North Dakota. BNI Coal, Ltd.’s Center Mine produces an average of 4.5 million tons every year with coal being sold to the nearby Young Station. Mining began at the Center Mine in 1970, supplying about 1.5 million tons a year to the Young Station’s Unit One. When the second unit was built, the Center Mine expanded in 1977. The mine merged with Minnesota Power and became a subsidiary of ALLETE in 1988. Western North Dakota has over an 800-year supply of lignite that is currently accessible and economically feasible to recover. Lignite mining is not totally without risk. As lignite mines are excavated, there is some risk that the pit’s tall, sloped earthen walls could collapse after a heavy rain. However, such incidents are extremely rare, in part because the industry has developed constant monitoring systems to alert managers when weather might be affecting mining conditions. 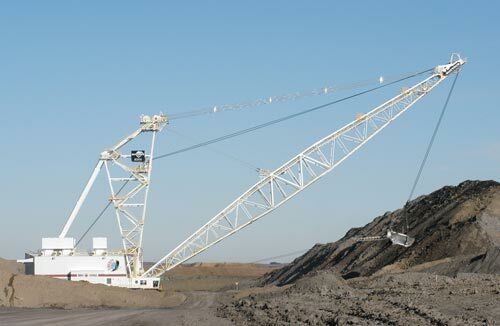 The most common accidents in lignite mining are associated with the maintenance and operation of the heavy equipment required to dig and haul the coal. Injuries are rare and usually minor. Safety is an ongoing priority for the companies that mine lignite in North Dakota. In September 2005, North Dakota’s Freedom Mine won the “Sentinels of Safety” Award from the Federal Mine Safety and Health Administration. The award is a special recognition for large surface coal mines. The 800-year supply of lignite is based on a supply of 25 billion tons and a current production rate of 30 million tons per year. Source: Strippable Lignite Deposits of North Dakota, Edward C. Murphy, North Dakota Geological Survey, 2001. Power plants using lignite generate electricity 24 hours a day so it’s there whenever you need it, to heat your home, run your lights. Mining companies reclaim land where lignite has been extracted. During a tour of a coal mine, you can see high-yielding wheat fields and pastures where coal shovels once scooped up overburden and lignite. Lignite-based power plants in this region generate electricity at a cost significantly below that of all coal and natural gas power plants nationwide. 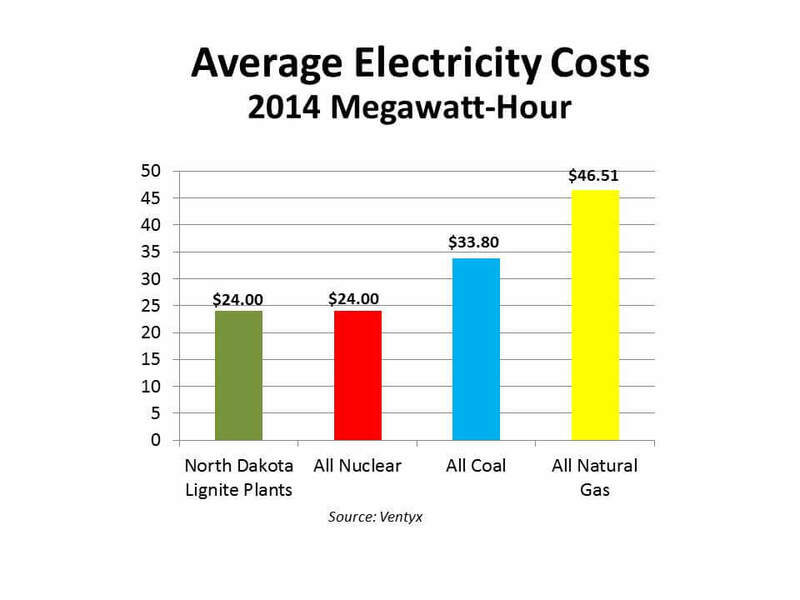 The use of lignite to generate electricity results in lower electricity costs for consumers, farms and businesses in North Dakota, Minnesota, South Dakota and Montana. Lignite is used in an environmentally responsible manner by power plants. Lignite-fired power plants have invested about $2 billion in state-of-the-art technology to keep our air clean. This investment accounts for 20 to 30 percent of the cost of a power plant. 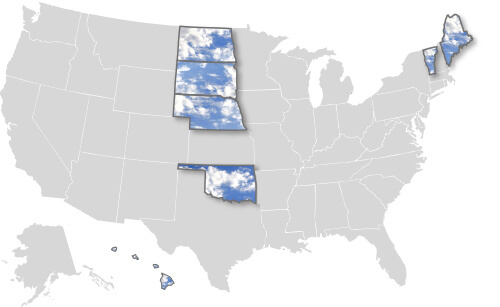 North Dakota is one of only 7 states in the nation that meets all of EPA’s strict federal ambient air quality standards (Hawaii, Nebraska, North Dakota, Oklahoma, South Dakota, Vermont, & Maine). 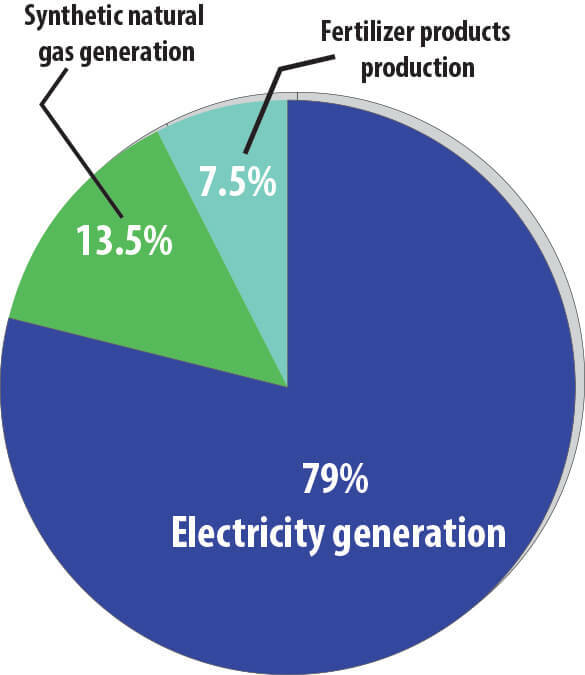 In 2014, lignite production was 28.7 million tons. 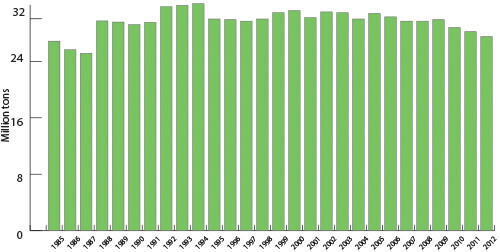 North Dakota lignite mines have averaged about 30 million tons annually since 1988. “Lignite” counties have some of the highest wages per job in North Dakota. Coal counties are; McLean, Mercer & Oliver. The average wage in North Dakota in 2013 was $47,779. According to the NDSU Agricultural Economics Department, the lignite industry is the state’s fifth largest industry behind agriculture, tourism and manufacturing. Oil/natural gas is ranked second. The economy of the western and central region of North Dakota, including Bismarck-Mandan, is highly dependent on the energy industry. The energy industry (coal mining, coal conversion, and petroleum and natural gas extraction, exploration and refining) accounted 31.9 percent of the state’s economic base in 2012. The lignite industry directly employs 3,979 people in North Dakota. For every direct job provided by the lignite industry, another three jobs are needed to supply the industry with goods and services. Thus, there are 11,497 indirect employees. Total employment is 15,476. Lignite industry expenditures are $1,087 million. Each dollar spent by the lignite industry circulates through the state’s economy another three times. Thus, total business activity is more than $3.3 billion in North Dakota. About 79 percent of lignite coal is used to generate electricity, 13.5 percent is used to generate synthetic natural gas, and 7.5 percent is used to produce fertilizer products (anhydrous ammonia & ammonium sulfate). A very small percentage is used as home heating fuel, for use as fertilizer and for use as oil well drilling mud. The electricity generated from lignite is used by over 2 million consumers and businesses in the Upper Midwest, while the Great Plains Synfuels Plant supplies synthetic natural gas made from lignite to 400,000 homes and businesses in the East. To learn more about the various uses of coal combustion and coal gasification byproducts, click on the links at left. Fly ash is a fine particulate waste product produced during coal combustion. When used instead of cement, the ash enhances the quality of the finished concrete product by making it stronger, more durable and easier to finish. Some producers are now replacing 30 percent or more of their cement with fly ash. Cement production is an energy intensive process and more than a ton of carbon dioxide is emitted for each ton of cement produced. However, each ton of fly ash used in place of cement reduces greenhouse gases by at least a ton. Bottom ash can be used as an aggregate in road bases, pavement and cement. It also serves as a good alternative to sand for roads in the winter. As coal is burned in a power plant to produce electricity, there is a significant amount of heat generated from the boiler that typically goes unused. However, recently many coal-fired power plants are looking to utilize this waste heat to produce ethanol. The most expensive part of an ethanol plant is the boiler required to produce the ethanol. Eliminating the need for a boiler by using a coal plant’s waste heat saves millions of dollars and only requires that the ethanol plant be built next to a coal-based power plant. Dephenolized cresylic acid is used in the production of industrial solvents, industrial resins and antioxidants. It is also used in the manufacture of pesticides. Through further refining it can be made into cresol, which is used in disinfectants, perfumes and preserving agents. Catechols are used to manufacture pharmaceuticals, insecticides and food flavoring. Naphtha is used in the production of gasoline and benzene. It is also used as a fuel for camping equipment, a cleaning fluid, an ingredient in shoe polish and even a medium in oil painting. Phenol is used to manufacture the resins that bond plywood together and is also used in the casting industry. When sequestered, or stored, carbon dioxide can be piped to partially depleted oil fields where it is used to enhance oil recovery capabilities. Doing this prolongs the life of the oil field and allows more oil to be recovered than by drilling alone. 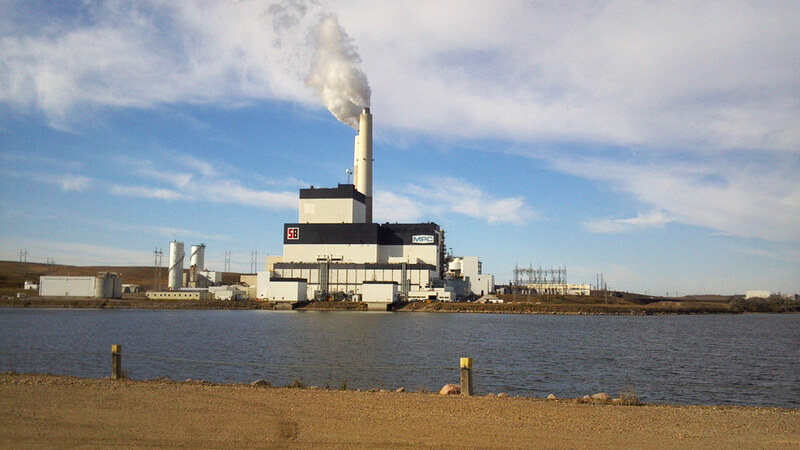 North Dakotans benefit in multiple ways from affordable and reliable power generated at the state’s lignite-based power plants. Low-cost electricity helps farmers and businesses because it lowers their operational expenses and allows them to be competitive on an international level. It also promotes industrial and economic development, since low electricity costs attract new business and help retain our existing companies. Low-cost electricity is particularly beneficial to our region as we consume high amounts of energy because of our weather extremes while enjoying some of the lowest electric rates in the nation. North Dakota’s average electric rates are among the lowest in the U.S., and about 28,000 jobs in the state are due to the lignite industry. In fact, people working for the coal industry in North Dakota enjoy some of the state’s highest wages. North Dakota’s economy receives about $3 billion in total business activity due to coal, and about $100 million in state tax revenue annually.